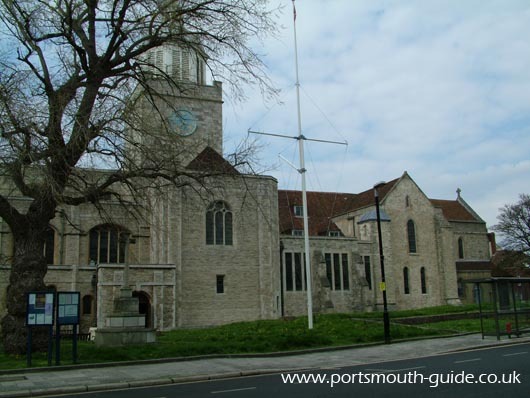 As with most of Portsmouth, Portsmouth Cathedral is surrounded in history. In about 1180 Jean de Gisors, the founder of Portsmouth, granted land to build a chapel and in 1188 Richard Toclyve consecrated the chancel and nave. In 1196 Godfrey de Lucy consecrated the transepts, altars and churchyard. The church survived a French raid in 1337 and in 1449 the Bishop of Chichester was murdered by local sailors. The town's inhabitants were excommunicated and the church was closed. In 1591 Elizabeth I worshipped in St Thomas's church and in 1642 during the Civil War the church was bombarded by Parliamentarian forces. In 1662 Charles II married Catherine of Braganza in the nearby Domus Dei church. In 1693 a new nave and west tower were completed. Between 1902 and 1904 the church was closed for restoration work to be carried out and in 1927 the Diocese of Portsmouth was created. In 1932 Sir Charles Nicholson published plans to enlarge St Thomas's Church. In 1939 due to the outbreak of World War II work on the extension scheme stopped. This means Portsmouth had the only incomplete Cathedral in England from 1939 until 1991. In 1990 work was started to complete the scheme and in 1991 the completed building was consecrated in the presence of HM Queen Elizabeth the Queen Mother. The Cathedral stands as a prominent landmark in Portsmouth and can be spotted easily from the air. It is located in old Portsmouth just off of the High Street. When entering and leaving Portsmouth by ship a glimpse of its turrets can be seen. In the Cathedral there is a Navy Aisle where bones recovered from the Mary Rose lay. The stones inscription reads "Here lies a member of the ships company of the Mary Rose", "May they rest in peace 19th July 1984". There is also a memorial to the crew of the fishing vessel Wilhelmina J. The inscription on the memorial reads "In memory of the members of the Ship's Company of the Wilhelmina J lost at sea 10 April 1991 Michael Bell, Jeffrey Venters, Guy Ransom Davies, Christopher Thomas, Matthew Hodge, Mark Fitz. The cathedral is a really nice building as can be seen from the above picture and its interior is just as impressive as its exterior. For more information please visit the following site www.portsmouthcathedral.org.uk.